in order of bestiness, starting with the least good and working toward the most magnificent. I’m a big fan of mix tapes. I made my first one the summer after I turned 8, and it featured the stylings of Patty Larkin, The Four Bitchin’ Babes singing this little number , and in a move that probably frightened the neighbors when I plugged my stereo into the outdoor jack on our back patio and turned the volume up, a little Rain Dogs. I soon graduated to recording my favorite lite rock hits on my clock radio alarm clock, and, as some of you now might be victim to by now, when Napster rolled into town, I was a CD burning machine. In college, I burned CDs for all occasions – birthdays, parties, gifts – and met all sorts of friends who did the same for me. So I picked up this book because it was kitschy. They sold it at Urban Outfitters. I wasn’t expecting to enjoy it as much as I did, or be moved as much as I was. This is the memoir of Rob Sheffield’s young life, each chapter beginning with the tracklists of a mix tape that would become poignant during the story to come. The first mix tape was for a school dance, where the shy, geeky kid was given his first taste of the power of music – suddenly, he was controlling the songs to which kids would DANCE – he could show off his obscure but hip music tastes, orchestrate strategic slow dance opportunities, and, best of all, the prettiest girls in school were coming to Rob, asking him to please please PLEASE play his favorite song. 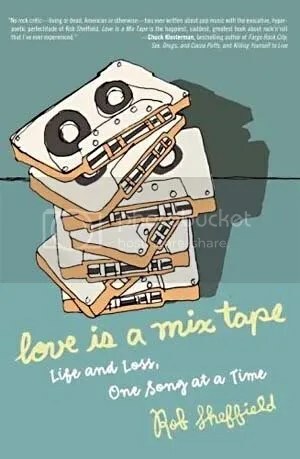 But this book isn’t all cute anecdotes and reverence for the rise of alternative music in the early 1990s; this book is a story of love, between Rob and his girlfriend, then wife, who would die unexpectedly from a pulmonary embolism at a tragically young age. Love of music united Renee and Rob from the beginning of thier relationship- they met at the only arena for alternative music in their rural university town, a restaurant with a music venue in the basement – and when Rob was left alone a few years later, it would be the boxes and boxes of mix tapes she left behind that would remain as his lasting connection to her. This book will probably break your heart, but Rob manages to write his story in a light, laugh-out-loud style. I listened to this book on audio, read by the author – and I wished myself more places to drive so I could finish it all the sooner. Buy this for: the last person for whom you made a mix CD, for your girlfriend (maybe with a mix, if you want to impress her with your devotion to her), or perhaps a companion for one of these nifty gifties? P.S. If you like themed mixes as much as I do, or maybe even a small percentage as much as I do, because I do like them a lot, then check out what my good buddy, and #1 mix CD sharing pardner, Frank is up to. His new blog, My Mixed Up Week, launches in the 2009, and he will be posting themed mixes on a WEEKLY BASIS, and might even send you a personal copy? It’s gonna be fun. I can sense it. Thirteen years after I first threw my classroom copy of The Sign of the Beaver to the floor with disgust and said “Please give me back my Alice book, kthnx,” I have finally, finally FINALLY grown to appreciate historic fiction. And this book had a great part in this miracle, let me tell you. Edna Pontellier is a turn of the century wife and mother, living among the wealthy elite in New Orleans after her marriage to a successful businessman. The book begins by detailing the Pontellier family’s extended holiday in the resort area of Grand Isle. Days are spent dining and socializing with the right kind of people, people who Edna doesn’t always like, while the children are tended to by nannies and the husbands either talk business or take the ferry back to the city to do business. With all this free time, Edna has the opportunity to make new friends, including Robert LeBrun, a much younger man who shows her attention and affection that she can’t help but accept. By the time the holiday draws to a close, Edna realizes that she is falling for him, but Robert is leaving for a business trip that will take him out of the country for an indeterminate amount of time. Returning to New Orleans, Edna liberates herself from her home, her responsibilities, and finally lets herself live the life that traditional laws of the wealthy Creole culture don’t want her to live. Not to say that The Awakening is historical fiction. The book was published in 1899, for heaven’s sake. But although this is a piece of classic literature, I didn’t find myself tripping over the language or, alternately, rolling around in it. I didn’t read with any particular interest in who the narrator, Edna, would end up with. I read it as commentary on being female, both in Upper Class New Orleans for housewives, but in the Now for Me. Edna takes steps in this book that put her outside the norm, and she is alternately rewarded and punished for those choices. And while the choices and options for women in American have grown and grown and grown, there are still times when I feel like Edna, boxed into expectations that I can’t understand, and even like some of the other female characters, like Adele Ratignolle, who is a portrayed as content to tend her brood and serve her husband. After reading Chains, The Astonishing Life of Octavian Nothing, and The Awakening, I am now very interested in history. It’s more than learning how to tie knots from an Indian in the woods. It’s about how society has grown and evolved, how the mistakes we made will travel through generations, and gosh darn it, I want to know more. Buy this for: your favorite feminist, or pair it with the most excellent, National Book Award nominated The Disreputable History of Frankie Landau-Banks by E. Lockhart, which I read twice this year, but haven’t mentioned on these here lists because, oh, last year I gave it first billing. A great look at early roots of feminism and how those same principles play out today, for teenagers. Finally got around to reading this book that Every. Body. Loved. and duh… I loved it. Liesel is the daughter of a Communist. However, since she lived in Germany during Hitler’s reign, she was separated from her mother (who was probably “taken care of” shortly after) before she even knew what a Communist was. On the trainride to her new home, she watched her younger brother die, and stole her first book: The Grave Digger’s Handbook. When she is left with the Hubermanns, this book is all she has left of the family she once knew, and she doesn’t even know how to read. But what really makes this book unique is that there is someone watching Liesel – it is her story, for certain, but she is not the narrator. The narrator is Death himself, the carrier of souls from one world to the next, who met Liesel for the first time and was the only witness to that first theft. Death meets with Liesel again and again as she grows up in Germany during the Holocaust amidst a cast of idiosyncratic neighbors, family, and friends, watching over her life as he goes about his very strenuous work during this time of great violence. I can’t really explain more of the details of this book without giving anything away, but this really is one you need to read to understand. Death narrates the story with the exhausted sorrow of any human faced with death day after day, the sympathetic humor, and an eye for details. Liesel grows from scared, lost girl to a strong young woman, and it is evident that it isn’t just Liesel’s merit that helps her do so, it is the power of the community of people who, despite obvious differences and dislike for one another, have a common respect for each other that defies some of the awfulness that is happening around them. I’d put this on the shelf next to Everything Is Illuminated by Jonathan Safran Foer. If you enjoyed that one, you’ll definitely appreciate The Book Thief. In terms of YA, this book does have a lot of violence, but it’s about as clean as the driven snow. My 15-year-old sister is reading it for English next trimester. It’s a Big Honking Book, but if you’re up for a challenge, do try to muscle through this one. 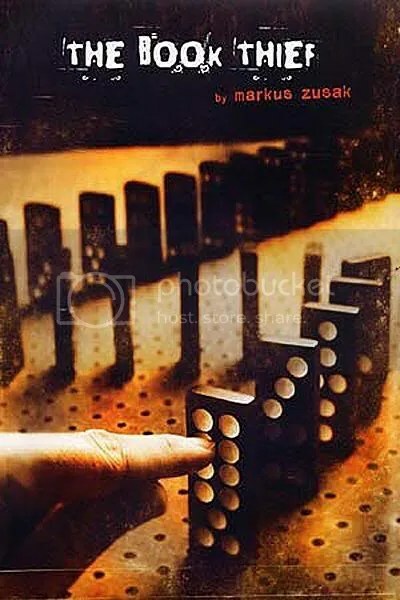 Markus Zusak is doing some amazing things with the young adult novel. I probably don’t need to tell you this, but he’s one to look out for. Buy this for: Those who cry over Schindler’s List, teens who aren’t afraid of a Big, Bad Book, or pair it with Everything Is Illuminated. This was the absolute first book I read in 2008, and as I listened to the kind of amazing audio recording by Matthew Lillard (yeah, that Matthew Lillard), I knew it would be one of the best books I read all year. Perhaps of all time. Please don’t ask me to list my favorite books of all time. Troy Billings has just about given up. He’s a 296 pound teenager. His father, retired military, can’t stand him, and neither can his athlete little brother. He doesn’t have any friends, no girls give him a second look. Ever. He’s standing on the edge of the subway platform, trying to decide if splattering himself would be funny. Everything about a fat kid is funny, he’s learned, and if he’s going to commit suicide, it shouldn’t be funny. But someone interrupts his contemplations and that someone is Curt McCrae. Curt is a legend at his school, and has that aire of mystery that comes with celebrity. Most people hadn’t even met Curt, just heard about him. Heard he was playing with a new band that might open for KingPin. Heard he was homeless. Heard he was dead. And Curt walks right up to Troy on the other side of the yellow line and completely rocks his life. Troy goes from friendless to having a constant, smelly, drugged out companion, one who insists that Troy, who has never picked up a drumstick, is going to be his new drummer at his upcoming gig at one of the hippest underground clubs in the city. The best part of this book is the voice. Troy, despite his physical failings, has got something to say. And when Curt enters his life, he wavers between clinging to the first real friend he’s ever had to running screaming from his wild, unpredictable behaviors. But the transformation of Troy’s life is equally Curt’s influence and Troy’s reaction to Curt. He learns to relate to his father and his brother, and all sorts of other touchy-feely things, but the world is pure lower-middle class NYC, and in Curt’s case, that place where some teenagers end up between school and the real world that can be pretty scary. This setting makes the choices in Troy’s and Curt’s lives more important, more life or death. In Troy’s world, there’s always room for sarcasm, for humor, but for anger and defeat as well. Jeez, after 12 days of this nonsense, I think I’ve lost my ability to say anything smart about books, but take my word for it: this is one you’ll laugh and cry with, and probably wish there was a sequel. Buy this for: Teenaged boys (so hard to buy for…), or teenaged boys (or girls) who think that the more obscure their music is, the better. Alright, the rest on the morrow. The grand conclusion. Exciting, I know!